What can I say about this perfect little white bow-tied number from Chicwish? I just had to have it for this Spring and Summer, and I can't wait to style these pieces together with different accessories, and also separate them and style this cute crop top with pants or a different colored skirt, and this fun skirt with another cute top! I got my first "matching set" last year, and I was pleasantly surprised with the versatility, because of all the different ways to pair it. Now, I'm completely sold on the matching set thing, and you can look for more in the future from me, for sure! 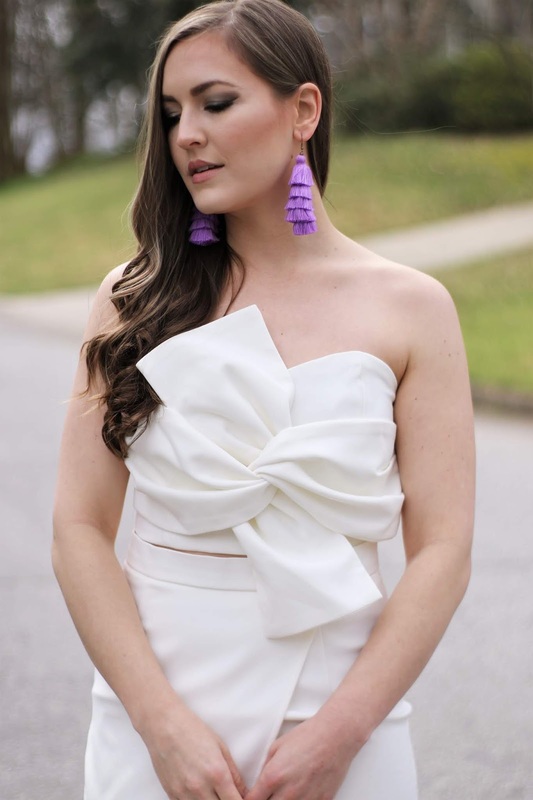 This time, I chose to use lavender accents to make this outfit feel more "Spring-like", but I could so see pairing this set with bright red pumps and a bold red lip to make an even bigger statement, in the Summer. I'll be sure to try that out for you, and also mixing and matching these pieces with different pieces I already have in my wardrobe. Happy Monday everyone!! I hope you had a fantastic weekend! Ours was the best, and I'm feeling really excited for the week ahead! We had our family pictures on Saturday, as I mentioned in my last post, and those were complete chaos, as always. But, I'm really excited to see the pictures we got. At least, even though the kids didn't really cooperate, we got some cute shots of me and Ross, which we haven't done in a long time, so I can't wait to see those! Then, on Sunday, we celebrated my sister's birthday. We went to the cutest little rooftop bar, and I had the most delicious lettuce wraps, ever. It was so much fun. (My sister's birthday is today - she's actually an April fool's baby! haha Happy Birthday, Lauren!!) I'm now kind of exhausted, but also excited about tackling the week ahead! I hope you have a wonderful and productive Monday! Thanks for being here! As I told you on Instagram, I totally love this bow-tied set! You look amazing in it! I love how you paired white with purple. Thank you, Andreea! It's so fun, I'm going to love styling it different ways this Spring and Summer! Have a nice Monday! Thank you, Regine! I hope you're having a good Monday, so far! You're a real lady, Jessica! You're divine! Thanks, Filipe! This set definitely makes me feel that way! This looks so fabulous on you Jessica. I can't wait to see it broken up too, because it'll be so versatile!! Yes! So excited to style it that way!! Thanks so much, Jodie! Thank you, Kara! I love love this set with the giant bow, so fun!! I hope you have a great April, too!! Thank you so much, Melody! I hope you're having a nice Tuesday! I love the pairing so much! Thank you, Karolina! Have a great day! SUCH a dreamy look! Romantic to the max and I'm here for it- you look amazing! Thank you, Ashley! I hope you're enjoying your Tuesday! Thanks, Olga!! Isn't it fun? Have a nice evening! Such a gorgeous look! I always look your picks + the looks on Chicwish but I never feel as though I could pull them off. Thank you, Felicity! I think you totally could! Awww, thanks so much!! I hope you have a nice Thursday/Friday and end your week on a good note! Thank you, Rika! I hope you're having a nice Thursday, so far! Such a gorgeous dress! You look wonderful! Thanks love! I hope you're having a great week! You look amazing! Your outfit is both elegant and fun.